I almost forgot to mention that I've joined a quilt-a-long. Regina is hosting a rotating snowball quilt- a-long and lots of people are out there making them. I have a lot of bright squares, so I'm going to use those as leaders and enders for a while and see if I can get enough together for a baby quilt or two. Wouldn't these nine patches look nice alternating with some WOW snowball blocks? I'll see what I can dig out in the morning. This morning was ice skating as usual. I took the girls to that while Kurt took Ryan to football. We aren't always so sexually stereotyped, but he is one of the assistant coaches and I take rotary cutting to work on during ice skating. Last night I pieced together some green and light 2 inch strips and got them all pressed and ready. Those went with me to ice skating and I worked on cutting the parts and pieces for Bonnie's Star Gazing quilt from the Scraps and Shirttails book. The pattern calls for 2.5 inch strips, but I'm using those for the GS Happy Blocks, so I modified the pattern a bit to help out my overflowing 2 inch bin. I was feeling an urge to work on something new, and this pattern keeps popping back into my consciousness. I couldn't do much more until after cookie booths. We did a pretty good business in front of a gas station with a carry out pizza shop. It was lunch time and there was a lot of traffic as people came and went with their pizzas. Sydney came with us even though she is in a different troop, she did a fabulous job and stuck with it for longer than some of the bigger girls. Finally, I was able to get back to my machine and start putting some blocks together! I think most of the quilt is somewhere in the pipeline, but these are the only blocks that are done so far. I put my design wall in the family room and asked Kurt for his opinion, much like a cook would ask someone to taste a dish and to see if it needed more salt. I was getting a mish-mash kind of vibe from the quilt and he is a fan of uniformity. Imagine my surprise when he said that I should try using more colors! He thinks all of the greens look too much alike and he thought they were all the same at first. Really? Maybe we just need better light in the family room, because those greens look pretty different to me. It isn't too late yet, so I'll work a few more blocks through and maybe mix in a few more fabrics. I'm not sure how big this quilt is going to be yet, so I don't know how many blocks I will need. I guess I could figure those things out and plan accordingly. I tend to skip that part and end up with lots of half finished extra bits at the end of a quilt. I just finished off the last two blocks for Amy's BOM. The fun part of block of a block of the month is the chance to keep trying out new blocks. I've seen most of these patterns before at some point or other, but never committed to making any of them. After putting these together, I can sort out the ones I would want to use in an entire quilt from the ones I'll just happily include in my sampler and call it good enough -- and maybe a couple that I will relegate to the orphan pile and forget about for now :). These are the 6 blocks so far for the block of the month. Do you think that Amy, as a math teacher, realizes that there are three blocks each month? I think I'll leave out the ugly ones to make a nice snuggler size for a Christmas gift. So far that Florida star is a top contender for getting lost or forgotten. Blackford's Beauty came together very nicely. It has cute little flip and sew corners that make a little star in the middle. I think this is one that Bonnie used in Jarrod Takes a Wife. I had always pondered trying it out. I can see changing the colors up a bit and trying out a dark center with two colors of star points. Add to that some scrappy corners and it would be a happy little quilt nicely put together from the strip bins. The second one had LOTS of half square triangles. It is called Mosaic Star, and it came from a book called Grandma's Best Full-Sized Quilt Blocks. I thought the name rang a bell when I saw the pattern, and sure enough, I went and found it on my bookshelf. I guess it is a small world of quilters. It needed a little resewing because I twisted the four patches a bit, but other than that, it came together nicely enough. It is almost exactly the right size, just a quarter of an inch too big overall. Not bad at all in my opinion. It is almost time to go pick the kids up now, so I'll go get all my little bits and pieces put away until next month. Thanks Amy for organizing the block of the month -- even if you should be calling it blocks of the month! Warning --obligitory post vacation post -- feel free to skip or skim. The first day of our cruise was a day at sea. It wasn't hot, but we were happy enough to lounge by the pool with books and enjoy the shipboard activities. The jogging track was quite nice and the spa was beautiful. There was a very lavish pool for adults only with cushy lounge chairs and lots of hot tubs as well. We found an Irish Pub after dinner that had a sing-a-long guitar player who specialized in drinking songs. Our first port of call was Labadee. People always called it Labadee, and tried to pretend that it wasn't in Haiti. Before we left, the kids kept asking if we were going to Haiti why we weren't going to help those people build houses. They didn't quite understand that it wasn't that part of Haiti. It is a very different part though. Not quite and island, but a very isolate peninsula with a big mountain and wall separating it from the rest of Haiti. The cruise line did spend the whole day unloading relief supplies from the ship, so that part helped assuage the guilt of vacationing in a disaster zone. Labadee was unscathed by the earthquakes. I guess it is hard to damage beaches and waterparks. Just about the time we docked and cleared for debarkation, the rain started to role in. It lasted until it was time to leave, varying in strength from drizzle to downpour. Obviously not a beach day, but we took a rambling hike through the rain and enjoyed the views. The area was absolutely beautiful, and it would have been a great place to lounge and soak in a little sun if the weather had been more agreeable. Jamaica was after that, and we didn't even get off the boat. We've been to Jamaica before and done the main attraction, which is Dun's River falls. It was spectacular, but we didn't really want to do it again. Not being much into shopping or haggling, we decided to enjoy the lovely, mostly empty, ship for the day. We splurged on a balcony room for the first time and enjoyed sitting out and enjoying the fresh air. I'm sure we would have spent more time out there if it had been just a little bit warmer, but it was nice to have the sun. The shows were good, especially the ice skating which included a really unusual routine with hula hoops and a black light. There was an excellent ventriloquist as well as a magician and comedian. The obligatory dancer/singers were there as well, with two big musical numbers. We had the late seating for dinner and ate way too much as most people seem to do on a cruise. I took advantage of the movie theater a couple of times, but there were lots of things we just didn't do -- karaoke, disco, street parties and parades. Something for everyone for sure. I think I mentioned that the kids were happy to have us home again. Sydney lost her second tooth -- isn't she cute? They are at school today, leaving me home to enjoy solitude and my sewing machine. At some point I should think about preparing for school next week, but for now I've got plenty of time to enjoy just being back again. I've got another BOM from Amy finished off and just shopped the stash for some more fabric to add to my collection so that I can finish off the last block for February. I'll do pictures of those "l8r" so check back for quilt related pictures tonight. We are just back from our cruise. I've managed to get some laundry done, but that is about all so far. My in-laws are still here until tomorrow, so another day until I can settle back into my bedroom and unpack. The cruise was great. Not fabulous weather unfortunately, but very relaxing. 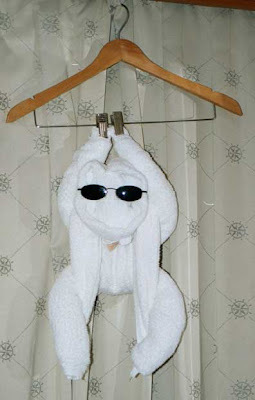 I'll do the full rundown tomorrow after I get the few pictures off our camera, but for now, here is a towel monkey just like the one that was in our stateroom yesterday. It is always hard to readust to real life after a vacation. There is nobody here to turn my towel into an armadillo or an elephant, nobody bringing extra desserts "just in case", nobody trying to convince me to order an extra entree at diner or delivering a daily list of activities to my room every evening. Still, there were no big hugs out there on the big blue ocean or little toothless grins telling me how good it is to have me home again. The kids all seemed to do very well while we were gone, though they were all happy to see us again. Kurt did spend the last two days of the vacation mentioning how much "Anna would love the ice show" or "Ryan would get a kick out of the magician". I think 5 days was a little longer than he wanted to be away from home. I was happy to be gone, but just as happy to be home again. I'm not happy with the way my jeans fit, but I guess I guess that is the price I must pay for all the "free" food. Cookie time is here. My nice clean study is now full of Girl Scout Cookies! I've gotten a couple of orders out already. Now to see how many more I can get out of the house before Saturday. I almost made it through the whole day at school today. I had planning the last two periods and took off a few minutes early to try to catch a quick nap before getting the kids from aftercare. I was tutoring after that and then doing the cookie thing. Wow is that cruise starting to sound like a really good idea. I was going to prep a few more DJ blocks for handwork, but I can't seem to find the freezer paper. I remember taking it to school when we did that rotisserie chicken dissection, but I was almost sure I brought it back again. It isn't all that easy to find, I looked at the grocery store on my way to the GS meeting Monday but couldn't find any. We are still sick today. Ryan got up this morning and got dressed for school but still had a fever and wasn't looking very energetic. He was kind enough to share his germs with me though, so I was in about the same shape. So sick day number two, I can't remember the last time that happened around here. Ryan was having a Star Wars marathon until lunch, but he's been asleep since then. I am obviously not feeling horribly energetic, but I have been slowly tidying the messy nooks and crannies that seem to keep popping up. Look, the guest room looks like it could have room for a guest in it. I found a spot in the cabinet for the dog's stuff so it wouldn't keep sitting on the counter. But sometimes things must get worse before they get better, and so not everything is put back together again yet. I'm out of energy though, so I think I'll take a little breather first. Kurt is picking up the cookies for me right now, but I've canceled our Girl Scout meeting for tonight. Not only don't I want to get everyone sick, but the thought of planning and organizing 8 10 year old girls right now makes me feel even more tired. Kurt is off to the big school board meeting where they will vote on the final zoning for next year, so at least it will be settled once and for all. Ryan was so cute at the doctor this morning while describing his symptoms and medical history to the nurse, she finally looked over to me and commented that I didn't really need to be there at all except for having to drive him. He was so tired after the early morning that he actually fell asleep on the examination table waiting for the doctor to finish sending in the prescriptions. He seems to be doing OK now. Hopefully we'll all make it through the night. Well, it's done. I can't say much more than that about this block. I used to make templates for everything, but it has been a while. Now I truly appreciate the accuracy of rotary cutting. Amy's directions were crystal clear, buy my execution leaves something to be desired. This one may need some minor surgery at some point in the future, but for now I'm sticking it in the box and calling it finished. Ryan is just now awake so I'd better see about getting him some lunch. Happy Monday everyone. I had sub plans ready and several Dear Jane blocks prepped with expectations of spending the day waiting. Kurt was going to stay home with Ryan when my day got canceled and his got booked up. 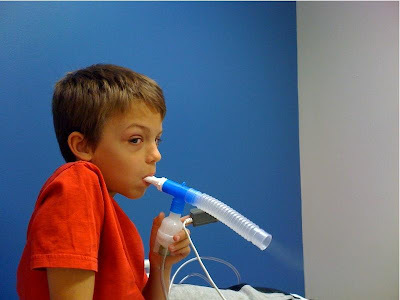 So I ended up with Ryan at the doctor getting a breathing treatment and warnings about his cough trying to turn into pneumonia. He's fast asleep now, leaving me alone with my sewing machine. I had already made the center portion of this Dear Jane block. I'm not sure when, but it turned up last night whilst I was getting things tidied. So here is Cabin Fever -- number A9 which has 45 pieces and is (of course) paper pieced. I keep repeating the Dear Jane moto, "Finished is Better than Perfect. I need to remember to cut my pieces bigger when paper piecing. They always seem huge to me and end up just fitting over the seam allowance. Still, I'm getting more competent at it the more I practice. I didn't have to reverse sew all that much and most of the seams match somewhat. There was a conspiracy to keep me from sleeping that started at 3 this morning. Anna came down to tell us that Ryan was crying because his ear hurt. That woke up the dog of course. I tried to get back to sleep, but busy thoughts were running through my mind of the things I need to take care of before the cruise next week. I was still pondering at 4 and decided to get up for the shuttle launch. I think there are only 4 more left, so I am making a point to watch them all. Now Ryan says his ear throat and tooth are all taking turns hurting and I thought I might as well just give up on pretending to sleep and catch a nap later to make up for a very early morning. It never seems to work out that way, but I'll keep telling myself that it will and hope for the best. I didn't accomplish anything major today, but I did a little bit of lots of things. Working backwards, I just (finally) put the last border on Christmas lights and pieced a back. We had Odyssey of the mind from 4 to 6 which doesn't really require me. Before that I took Anna to a class on how to potty train your dog and then to a Superbowl sale at my local quilt shop. I walked out without a single thing (gasp!) But none of the sales seemed that stunning to me. This morning was devoted to cutting happy block pieces so that I could put them away and clear off the dining room table. I also emptied and organized that pesky drawer next to the fridge that collects all the random refuse of our lives. I know you all have one just like it. Now we are cooking appetizers to eat during the Superbowl after which I will (finally) pull out the Dear Jane blocks I want to get prepped. I need sub plans for tomorrow, so I'll work on those next. Then it is laundry that needs folding and kids that need bathing. Just a normal Sunday around here. 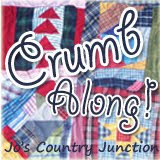 I hope you all have lots of fun quilting planned during the big game. Happy Sunday. I just put the last stitch in my Quilt 4 Kids called Vroom. The kit was very well organized with clear directions and went together beautifully. A lot of quilting was requested and I couldn't decide what color would work. Therefore I used orange in the orange squares, green in the green squares and black for the rest. I know I don't get any extra points for all that "fancy" quilting, but it was just such fun. I think next on my list is getting some Dear Jane blocks prepped for cruise. I've done most of the applique ones already so I'll have to see what else will work well by hand. I always feel silly doing simple straight seems by hand when a machine is so much faster and stronger. I didn't exactly get an early start this afternoon. As soon as everyone was in bed though, I pulled out my quilt kit from the mail and got it all put together. It went together super easy. Isn't it bright and cheery? I even perservered and got both borders on. I can baste and quilt tomorrow I hope after chess while Ryan is at football if the girls will play nicely for a while. If I can get it done by the afternoon I can walk it over to Miss Sheila for binding. I haven't read any of the directions about where to send it back, but I'll have to be sure to follow through on that. Somehow I always drop the ball when a trip to the post office is required. I'd like to spend some time this weekend getting some handwork ready to go for the cruise and such. Dear Jane blocks make a nice take along project. It has been a busy week, without a lot of time for quilting, but I did get a couple of quilty goodies in the mail. I have been watching Tazzie working on her Nearly Insane blocks and went ahead and ordered a copy of the book. I'm not sure if I'm going to try out some blocks, but I'll let the idea simmer for a while. The second is a Quilt for Kids kit that I have seen on Bingo Bonnie and Amy's Passions recently. They seem to go together quickly, so maybe I can get it finished on the weekend. Sydney started guitar lessons and is really enjoying them. Ryan wants to choose and instrument now that both of the girls are taking lessons. Aren't they cute practicing a duet together? School has been busy this week. 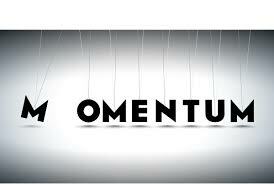 Interim reports were due today and it is the last week before midwinter break. We had a talent show and a career day to add to the excitement, so it definitely hasn't been dull. Just one week and one day until midwinter break and our cruise! Not that I'm counting down of course.